Snake Strike is a rare 2D platformer that rarely asks you to do all that much walking. Instead, aided by a fairy companion controlled with the mouse cursor, your adorable Blue Coral Snake protagonist zips through the air, utilizing the “Serpent Path” (蛇道 jadou) power to strike enemy animals, items, and targets, even passing through walls. While the core target-striking mechanic immediately reminded me of the last decade of Sonic the Hedgehog games, the game’s overall design philosophy reminds me most of Super Mario Bros. 3 in that every single stage has a design hook that makes it utterly distinct. 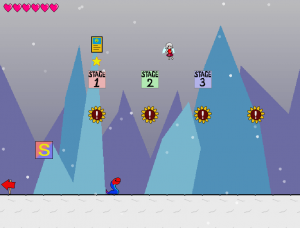 Each themed world presents you with three stages you must clear to face off against the stage’s boss, but each stage features unique enemies, environmental object, or layout patterns that mark it off from the rest. Even different screens in the same stage stand out from each other with the game apparently never wanting to repeat itself. Bosses, too, mine the game’s core mechanics for surprising implementations and depth. This level of care in the differentiation of stages and screens is lavished on the direction of other parts of the game. Like your player character, every enemy and boss is a wild animal and each animal and boss has a collectible card you can pick up in the game world, loaded with scientific facts and the species’s scientific name. A particular moment that helped me realize the careful attention to detail occurred when the final stage in an arid desert world launched my snake into the air to fight the area’s boss, a bald eagle. When you land back on the ground triumphantly, the desert landscape is transformed. It’s snowing. You’re headed to a snow world next. Part of the joy of the game is the discovery suggested here. When you arrive in the snow world, what kind of animals are you going to meet/face off against? How will they behave? After each boss is beaten you become friends with a new fairy that grants you a new fairy, each of which has a special power that alters the core mechanics of the game: one enables you to double jump, another gives you more health, etc. You can only use one of these at a time, though, so you can customize according to your play preferences or to meet specific challenges. Despite all this depth, Snake Strike gives an almost willfully amateurish impression with its visuals. 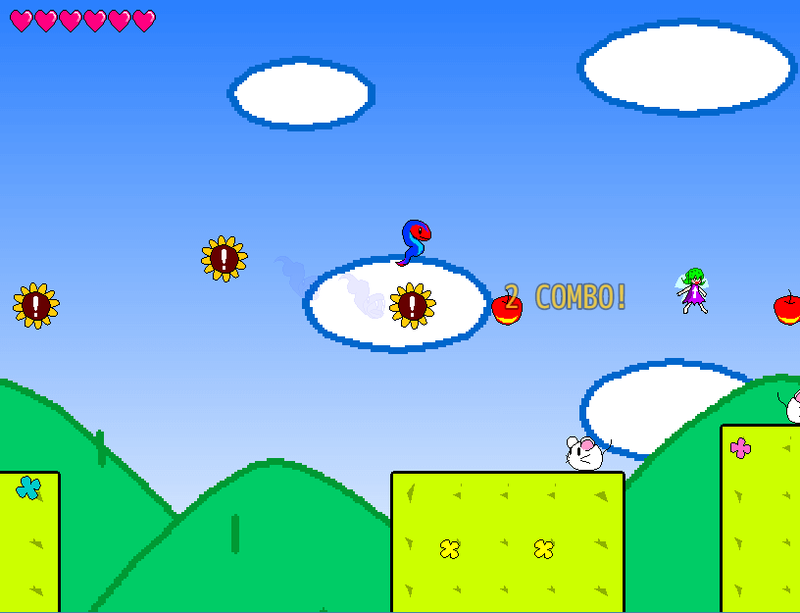 The game’s first stages, in particular, with over-saturated, overly-intense yellow-green grass tiles and clouds with thick blue outlines, are slightly garish. Later stages tend to look more visually pleasing. The diversity of environments and animals works as an interesting counterweight to this and the juxtaposition as well as the thoughtfully polished mechanics and level design. (The music, on the other hand, is excellent throughout. Especially enjoy the laid back, J-pop beats of the Fairy Park). 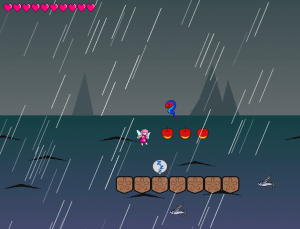 The game gets very tricky in its later stages. But through its novelty it earns every challenge (one might complain that the point at the bottom of the screen that counts as falling off the screen is a little too restrictive, but that’s forgivable). Snake Strike is a joy to play. Snake Strike is available for free from Freem (for Windows)! The game is Japanese-language only. So I’ve prepared a translation of some of the game’s early text and most important features. You can download my Unofficial English Player’s Guide as a PDF here (last updated June 1, 2018).